Use this page to find the best way to get in touch with us in order to utilize our resources. 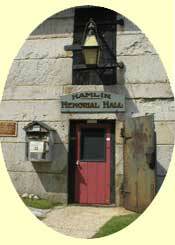 To reach Paris Hill and the Hamlin Memorial Library from the south take Exit 63 off from 495. Then take 26 North all the way through South Paris and take a right onto the Paris Hill Road. Follow the road up the hill and take a left onto Hannibal Hamlin Drive. We are the only little Jail on the left hand side of the road! For questions or comments concerning this web site see the footer at the bottom of any of the Hamlin Library pages.